John C. Jansma departed from this life on January 27, 2019 at the age of 97. He was born on April 5, 1921, in Gascoyne, North Dakota. 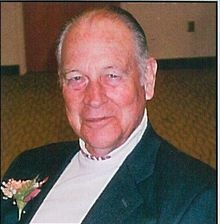 John graduated from Iowa State University in 1948 with a degree in chemical engineering. He was a 2nd Lt. in the U.S. Army where he commanded The Pack Field Artillery Unit. On June 30, 1942, he married June Lundquist in Westbrook, Minnesota. In 1948, John relocated to Ohio with his wife and young daughter to accept a position with Standard Oil of Ohio. John and June had two daughters, Patricia and Sheryl. John is preceded in death by his wife, his parents, Gerrit and Helen (Gesaman), and his three brothers and sisters-in-law, Marvin (Izetta), Thornton (Emily) and Gerrit Joe (Barbara). He is survived by his daughters, Patricia Kaye Jansma, Sheryl Raye Jansma Bair (James), sisters Judy Grimm (George), Mavis Jansma, Carol Hansen (Hans), his "daughter" Linda Doza (Douglas), and many nieces and nephews. John supported his wife and daughters during their tenure as educators. He served on many committees at various churches where he exhibited his passion for others. John displayed a lifelong advocacy for local, state and federal government issues. He was recognized for his devotion and contribution to the cause of higher education by election to The Presidents Club of The Ohio State University.